A good friend recently gave birth so when some friends and I visited her last week in the hospital, I thought of cooking her something which is simple yet nourishing at the same time. Remembered I still have some bottles of essence of chicken at home so a quick trip to the market in the morning to get some fresh chicken thighs to go along with some chinese herbs and dry ingredients I already have at home for a fix of 鸡精蒸滑鸡腿 Steamed Chicken Thighs with Essence of Chicken. 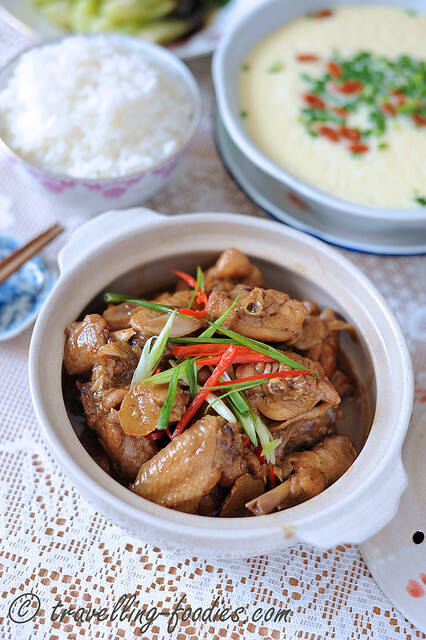 Teochew cuisine is characterised by a wide range of seafood dishes. 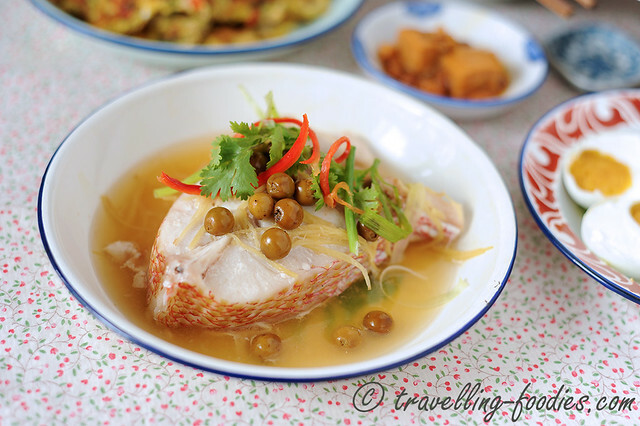 Blessed with the long coastal line in the Chaoshan region in southeastern China, the Teochew people are accustomed to having seafood as part of their everyday lives. From cold crab (潮州冻蟹) to braised cuttlefish （卤墨鱼), their famous shark’s meat jelly (鲨鱼冻), and of course fishballs (潮州鱼丸) the Teochews are well known for their seafood fare, and their innovative use of the precious produce from the oceans. When folks think of Teochew porridge 潮州糜, the first thing that comes to mind is individually grained porridge often cooked with sweet potatoes, enjoyed over a wide range of condiments and dishes, sometimes as simple as preserved olive leaves (橄榄菜), pickled lettuce stems (菜心罐) or salted duck eggs (咸鸭蛋), to pickled radish omelette (菜脯蛋) or even steamed threadfin (蒸午鱼) or braised duck (卤鸭). 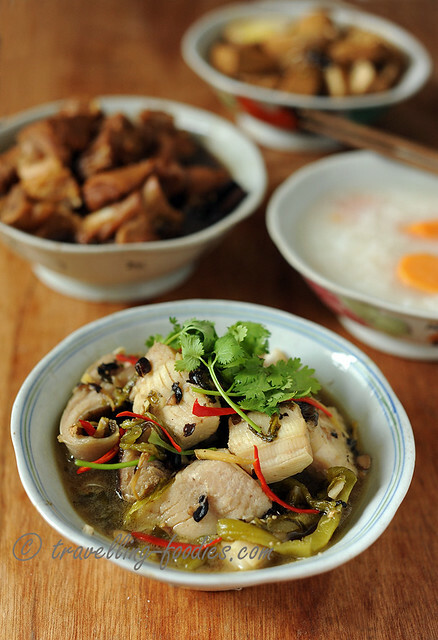 Otherwise, it would be something as wholesome as a one pot meal like Chinese Pomfret Porridge (斗鲳糜). Yet for most of the Teochews in the past who lived and breathed frugally by the sea, the expensive Chinese Pomfret or threadfin (午鱼) may not be an everyday indulgence. 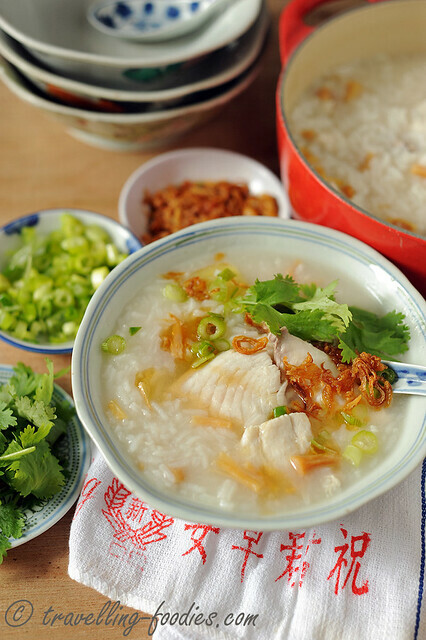 As such, other varieties of Teochew porridge evolved and most notably, shark’s meat porridge 潮州鲨鱼糜. Whenever we visit Taiwan, we love to bring back some of their local delights home. The usual culprits would be their 凤梨酥 pineapple cakes, 咔哩咔哩 twirly rice crackers and more recently organic fruit conserves using local fruits. But we also like to buy back some ingredients and condiments to prepare some dishes which allows us to savour those unique yet familiar flavours. Their 龙眼蜜 longan honey is more superior than those produced in Thailand while their 黑酱油 dark soya sauce is more aromatic than the varieties we get back home. Oh oh oh! And we love their seasonal fruits of course like 玉荷包 lychees and 艾文 mangoes! Quite recently, I was recommended by a friend，SF to try the Taiwanese pickled manjack berries known locally as 树子 shu zi, or more colloquially in Taiwanese dialect as 破布子 po bu zi. I love the Taiwanese 豆腐乳 fermented beancurd cubes so I thought their pickled manjack berries couldn’t taste that bad. And indeed, it was love at first bite! Con Nghêu Hấp is another Vietnamese dish which I’d gotten to know from dining at Luong Phuong with Syebvonne and the rest. 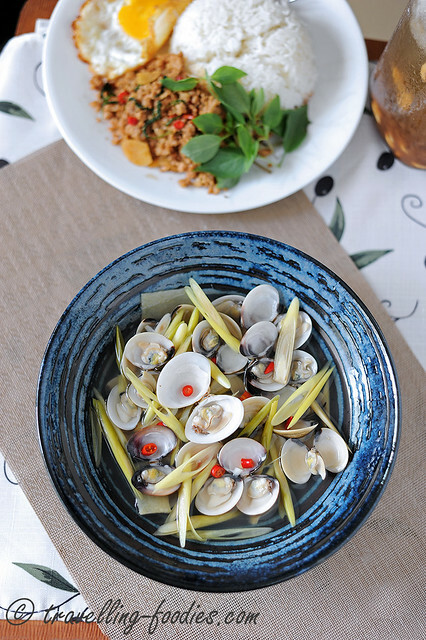 It is essentially clams which had been briefly cooked in a lemongrass broth. The Thais have a very similar version called Hoi Tom Takrai หอยต้มตะไคร้ but whichever versions you chose to cook, it is incredibly easy to prepare and yet so tasty at the same time! 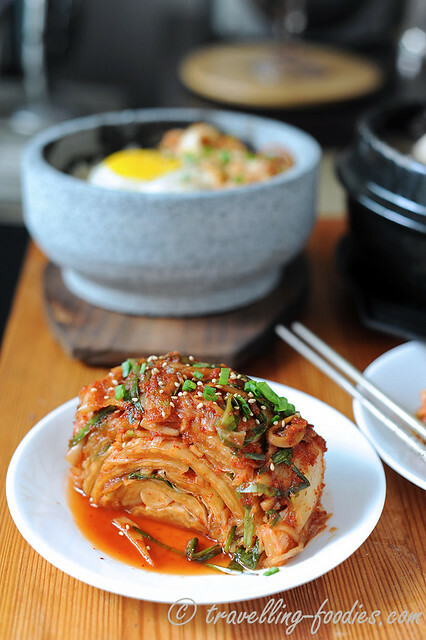 If every country has their own “national dish”, Kimchi must surely be Korea’s. 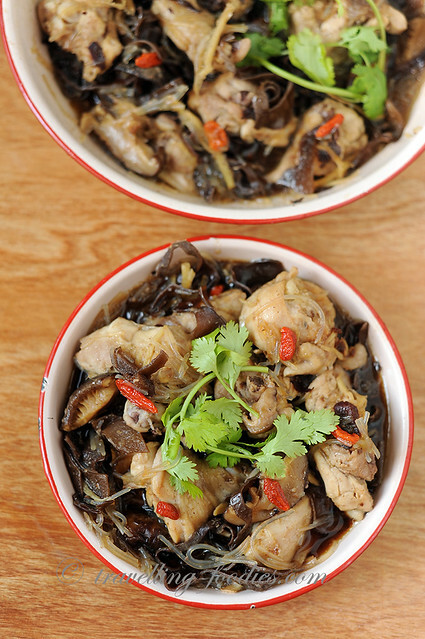 This spicy pickled Napa cabbage is so immensely popular, it is almost synonymously linked to Korean food culture. Its versatility deems it not only good to be eaten on its own, but also cooked in a large variety of ways from soups like kimchi jijae or kimchiguk, to kimchi fried rice (kimchi bokkeumbap) as well as flavouring the base of hotpots like dubu kimchi jeongol. Its versatility also means that it is eaten is in practically every Korean meal, be it casual street food on the go where one would find kimchi pancakes (kimchijeon), to very formal royal meals like the Susarang. Even if it is not eaten on its own, the paste for making kimchi is used as a dipping sauce, from hotpots to live octopuses! In Korea, kimchi comes in a large variety of forms. From the spicy version which evokes the liberal use of chilli pepper powder to the non-spicy and thus milder versions like the “water kimchi“. A large variety of ingredients are also used for pickling from white radish to cucumber but by far, the most popular and thus most common form of kimchi is made from Napa cabbage which the Koreans call baechu, giving rise 배추김치 Baechu-kimchi, that is Korean Cabbage Kimchi.